A huge night lies ahead for Wellingborough Town as they bid for survival in the ChromaSport & Trophies United Counties League Premier Division. Jon Mitchell’s side are currently in the drop-zone on goal difference behind Oadby Town, who host Harborough Town in their penultimate game of the season this evening (Tuesday). The Doughboys do have a game in hand and they take on Cogenhoe United at the Dog & Duck tonight before facing Sileby Rangers on Thursday evening and then rounding off the season at home to Harrowby United on Saturday. Elsewhere, there is a derby date at Sergeants Lawn as Rothwell Corinthians take on Desborough Town in both clubs’ penultimate game of the campaign. Corinthians were just edged out 3-2 by title-chasing Leicester Nirvana at the weekend while Ar Tarn were big 6-1 winners over Harrowby. 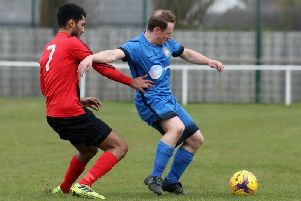 In Division One, bottom side Burton Park Wanderers will be looking to build on their 2-1 success over Bugbrooke on Saturday when they play Long Buckby at Latimer Park. And there is a local derby at London Road as Whitworth entertain Irchester United.